If you have your cooktop on the perfect settings, or are afraid of your children tampering with the controls while you cook, the Control Lock feature will come in handy. This feature disables the control panel so a wayward tap won't harm your cooking, or your family. Also available for microwaves! If you've only committed light spills during cooking, you probably don't need to use the full self-cleaning system. Instead, use the SteamClean Option. All that's needed is heat and water to make those little messes spotless with less energy being used. Also available in microwaves! This Whirlpool® electric range helps you cook for the family, even on a hectic schedule. Skip preheating and cook frozen foods faster with Frozen Bake™ technology. FlexHeat™ dual radiant elements on this self-cleaning range give you two elements in one for flexibility. 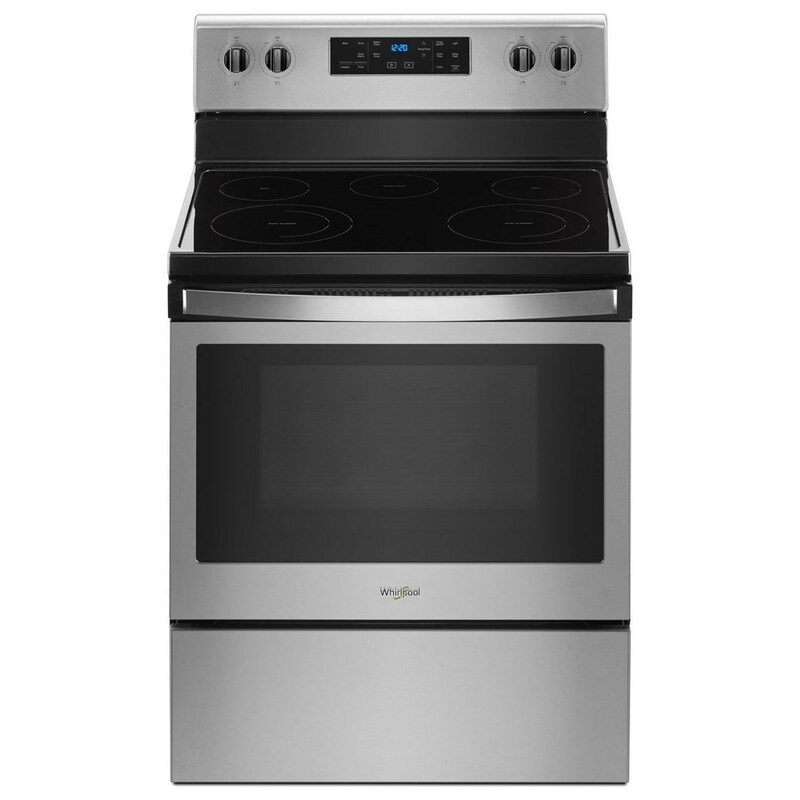 The ceramic glass cooktop on this Whirlpool® electric range with self-cleaning oven also makes cleanup quick. The Electric Ranges 5.3 cu. ft. Freestanding Electric Range with 5 Elements by Whirlpool at Furniture Fair - North Carolina in the Jacksonville, Greenville, Goldsboro, New Bern, Rocky Mount, Wilmington NC area. Product availability may vary. Contact us for the most current availability on this product. The Electric Ranges collection is a great option if you are looking for Appliances in the Jacksonville, Greenville, Goldsboro, New Bern, Rocky Mount, Wilmington NC area. Browse other items in the Electric Ranges collection from Furniture Fair - North Carolina in the Jacksonville, Greenville, Goldsboro, New Bern, Rocky Mount, Wilmington NC area.